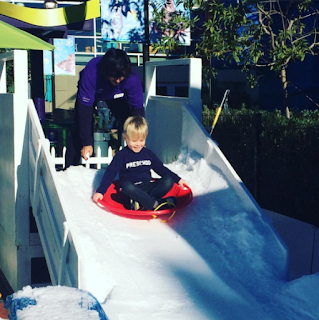 Will enjoys the snow slide at Discovery Cube LA's Winter Wonderfest. Who says there's no snow in L.A.? Discovery Cube Los Angeles is bringing a winter wonderland to SoCal from now until January 8, 2017! Be sure to bundle up and get there early, because the science center's "Winter Wonderfest" has four different slides and even an area where kids can make their own snowballs. In addition to the snowy playground, there are two sledding areas for kids. One is for younger kiddos (see above), and one is slightly larger for kids ages 6+. There's also a 75-foot tubing tower that CC and I raced down. Check out the video below! Tickets: $12.95 for general admission (adults and kids — online price). Kids ages 2 and under are free. Winter Wonderfest is an additional $7 per person (non-member) or $5 (member). I have to admit, I'm so excited for this time of year! 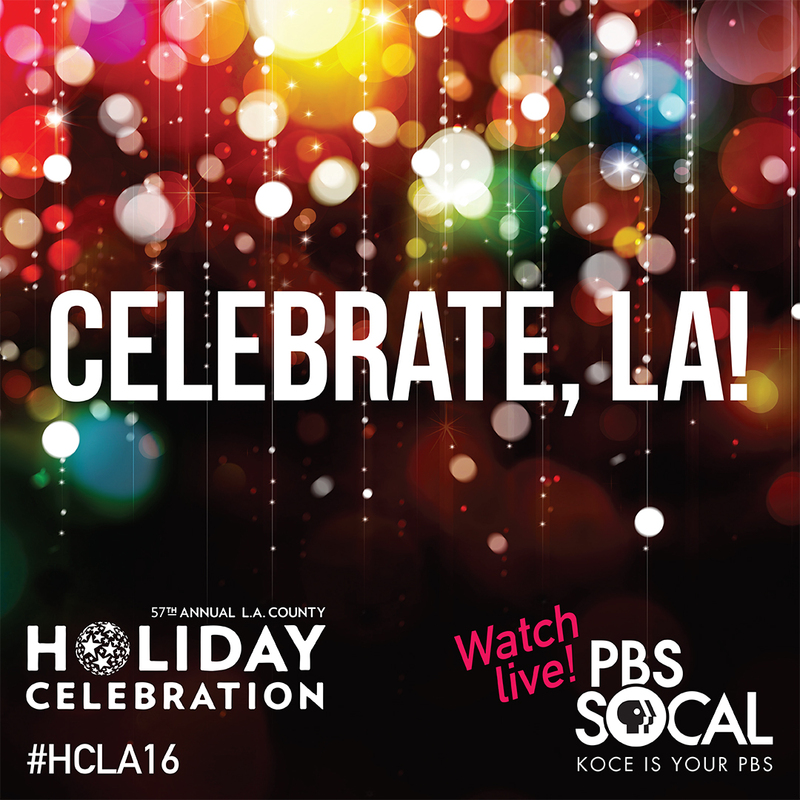 One of the major L.A. events that makes Christmas and the holidays especially fantastic is the annual L.A. County Holiday Celebration, which takes place on Christmas Eve at the Dorothy Chandler Pavilion. The 57th annual L.A. County Holiday Celebration will feature Cheryl Burke of "Dancing With the Stars" fame and actor Brian White ("Scandal") as hosts, and once again the lineup of multicultural performers from around the county looks like a must-see. CC and I have visited a few of the rehearsals from past celebrations and attended the actual performance a few years ago. We had so much fun every time — especially getting a sneak peek of what's to come. This year's lineup looks just as wonderful. Not only that, but the three-hour performance featuring more than 21 acts is completely free. Parking is even free! 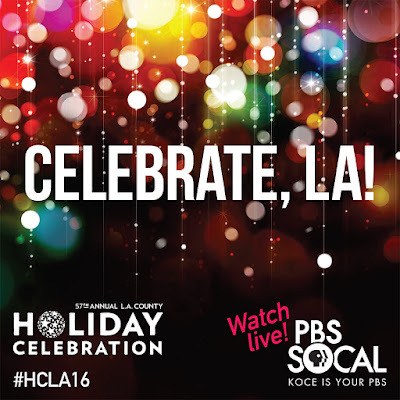 For those unable to attend, PBS SoCal will be airing the celebration live as well as multiple times after that (check info below). Performers include Grandeza Mexicana Folk Ballet Company with a folklórico dance from the region of Tabasco, Mexico; Harmonic Bronze Handbell Ensemble, performing classical handbell repertoire that celebrates Christmas and Hanukkah; QVLN (Q-Violin), bringing his “Brazil meets Jimi Hendrix on an electric violin” stylings to the Christmas classic “Little Drummer Boy”; Latin jazz band Cuba L.A., performing selections from their Christmas CD, “Navidad Cubana”; Kayamanan Ng Lahi Philippine Folk Arts, with festive dances from the provincial lowland/coastal region of the Philippines; and much more. The event has been sponsored by the Los Angeles County Board of Supervisors every year since 1959. What a tradition! Both admission and parking are free (first come, first seated). Entertainment on the Music Center Plaza begins at 12:30 p.m., and doors open at 2:30 p.m. For more information, visit HolidayCelebration.org. No reservations or tickets; first come, first seated. Entertainment on the plaza begins at 12:30 PM. You may come and go throughout the three-hour performance. Dorothy Chandler Pavilion at The Music Center135 N. Grand Ave.
CC got her groove on at the "Sing" stage at Universal Studios Hollywood. CC has been waiting for "Sing" to hit the big screen for months now, and last week we got to catch a screening of the sassy sing-along movie that hits theaters December 21. Let's just say this family-friendly movie has a lot of heart—and soul. 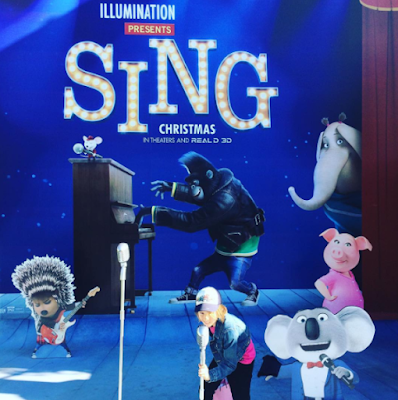 If you don't know the story, "Sing" centers on a good-natured showman of a koala named Buster Moon (voiced by Matthew McConaughey) whose theater has fallen on hard times, so he launches a singing contest to help revive his venue and career. All kinds of animals flock to the auditions, and we get to hear all sorts of fun tunes in the process — everything from rap to pop to big band. 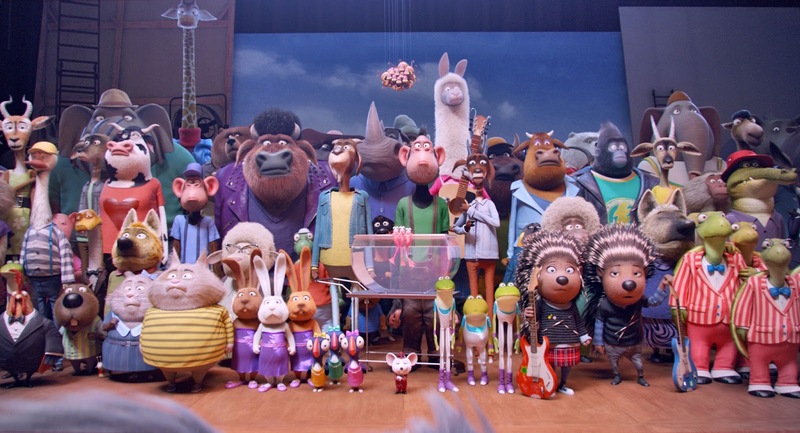 Buster then narrows the roster down to six contestants: Mike (Seth MacFarlane), a dapper mouse who's also got an attitude and something up his sleeve; Meena (Tori Kelly), a shy teen elephant who has a fantastic voice; Rosita (Reese Witherspoon), an overburdened mother with 25 little piglets; her partner, Gunther (Nick Kroll), a German-sounding pig who is sassy, sequined and hilarious; Johnny (Taron Egerton), a young gangster gorilla who's trying to get out of the family business; and Ash (Scarlett Johansson), a punk porcupine who's having more than a few issues with her self-centered boyfriend. The PG-rated movie is both rousing and heartwarming. Right from the beginning, when Jennifer Hudson as a former star of Buster's theater belts out a kickass cover of the Beatles' "Golden Slumbers," CC (who's a huge Beatles fan) and I knew this was something special. The story itself is inspiring, and don't be surprised if you find yourself singing along, too. Who can pass up roller skates and pizza at Platform in Culver City? 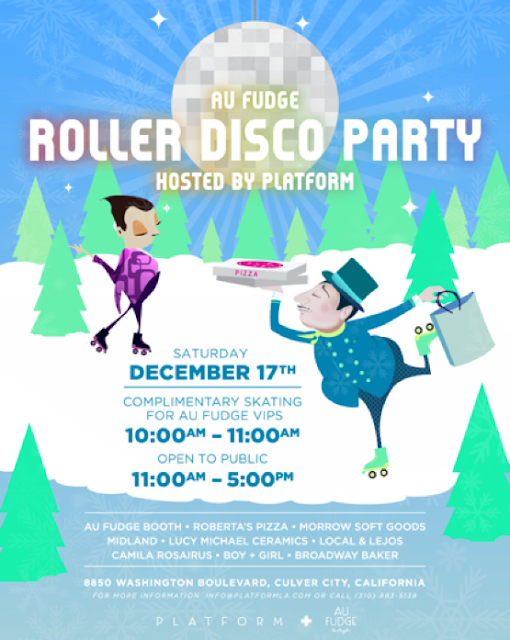 Join Au Fudge for their Winter Wonderland Roller Disco hosted by Platform on Saturday, December 17. The rink will be open to the public from 11 a.m. to 5 p.m. You won’t want to miss Roberta's Pizza, Morrow Soft Goods, Lucy Michael Ceramics, Local & Lejos and more! CC, Will, Ian and I had such a great time at the Au Fudge pumpkin patch at Platform back in October. Can't wait to check out their latest joint event. 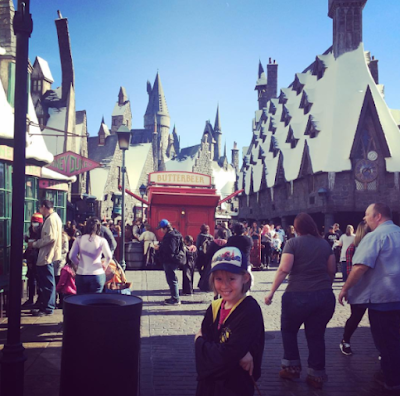 Birthday fun at the Wizarding World of Harry Potter! Harry Potter, Hogwarts and Hogsmeade were popular topics on Sunday, as CC and I celebrated her 10th birthday mother-daughter style at the Wizarding World of Harry Potter at Universal Studios Hollywood. The Boy Wizard has been a popular theme around our house after I finally convinced CC to start reading the series this summer. It took some convincing—she was a little gun shy (wand shy?) after having caught a glimpse of the first movie a few years ago and getting pretty scared. My trick? I just started reading it to her at night, and about 30 pages in, she was like, "Ok, Mom. I've got this. I'll take it from here." Now, she's already on Book 6, "Harry Potter and the Half-Blood Prince." So after her blow-out Harry Potter birthday party on Saturday with Will, our neighbors and kids from her class, I surprised her with a trip to Universal—and we loved it! Our first stop was Honeydukes, the adorable candy shop that offers everything from chocolate frogs, jelly slugs, Bertie Bott's Every Flavor Beans, chocolate wands and butterbeer fudge. Yes and yes. What a magical little shop! Let's just say, we didn't leave empty-handed. Next, it was off to Hogwarts to check out Harry Potter and the Forbidden Journey! The ride is beyond cool, but waiting in line has never been so bearable. As you wait to board, you're taken through a tour of Hogwarts that includes Dumbledore's office, the Gryffindor lounge and the Defense Against the Dark Arts classroom. With talking portraits and moving books, you feel completely immersed in the Hogwarts world. The ride itself is like nothing I've ever experienced. (I know that sounds like an exaggeration, but it's true.) You sit in a pod of four seats, which takes you flying over Hogwarts, narrowly escaping dragons, dementors and a huge whomping willow. Not only that, but as you watch larger-than-life screens, you feel as if you're actually flying over the school of witchcraft and wizardry. It's amazing! While we wandered around Hogsmeade afterward, we came upon the Frog Choir, featuring singers from each house (Gryffindor, Ravenclaw, Slytherin and CC's own Hufflepuff), and CC was completely smitten by the singing frogs. I mean, who wouldn't be? And we had to get a pic. And trust me, we'll definitely be going back.